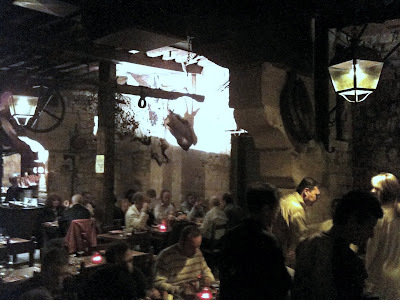 A friend had recommended I check out a different kind of restaurant on Ile St Louis -- Nos Ancêtres les Gaulois. We stopped by on Saturday night just to check it out on our walking tour when Linda and Joe arrived, and decided to eat there Wednesday night. It attempts to be a throwback to an earlier Gallic dining experience with an abundance of food and unending wine. For a fixed price of 38 EUR (recently marked down from 41 EUR), you get a 6 course meal: salad bar, vegetable basket, meat, cheese plate, fruit, and dessert. Plus you can constantly refill your table decanter with wine from real wine barrels. Well it is for the most part. The dining halls are definitely old world. The patrons are loud and roudy, led on my an older gentleman playing a guitar while standing on a nearby chair (and who seeks tips from all the tables afterwards). And the food was fine, except unfortunately for the main dish -- the meat. We each had different meats and all were either too fatty or chewy or not very tasty. 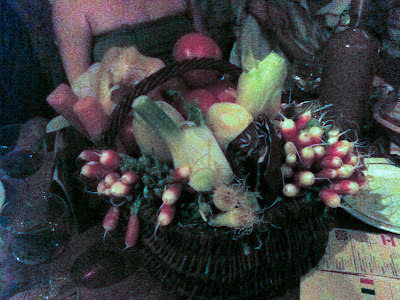 The corbieres wine was fine, the veggy basket was pretty cool -- I particularly liked the radishes and onions. The restaurant opened 40 years ago and has continued to expand but you get the sense that a novel idea and atmosphere has become a little too formulized over the years. I would go back again and hope our meat experience was an abberation. It is certainly worth one trip just for the novel experience and to visit Ile St Louis.